RENO, NV--(Marketwired - Jan 4, 2017) - New data from Synergy Research Group shows that across six key cloud services and infrastructure market segments, operator and vendor revenues for the four quarters ending September 2016 reached $148 billion, having grown by 25% on an annualized basis. IaaS & PaaS services had the highest growth rate at 53%, followed by hosted private cloud infrastructure services at 35% and enterprise SaaS at 34%. 2016 was notable as the year in which spend on cloud services overtook spend on cloud infrastructure hardware and software. 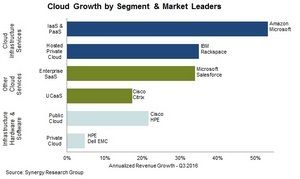 In aggregate cloud service markets are now growing three times more quickly than cloud infrastructure hardware and software. Companies that featured the most prominently among the 2016 market segment leaders were Amazon/AWS, Microsoft, HPE, Cisco, IBM, Salesforce and Dell EMC. "We tagged 2015 as the year when cloud became mainstream and I'd say that 2016 is the year that cloud started to dominate many IT market segments," said Synergy Research Group's founder and Chief Analyst Jeremy Duke. "Major barriers to cloud adoption are now almost a thing of the past, especially on the public cloud side. Cloud technologies are now generating massive revenues for technology vendors and cloud service providers and yet there are still many years of strong growth ahead."